Workshop on Assisting ESL Writers: THURSDAY 3/31! At WAC, we often tell our faculty not to focus on lower-order concerns when grading first draft or low-stakes writing: small grammatical mistakes, using the wrong word, subject/verb agreement. Our philosophy, which is backed by a number of studies, dictates that if we help our students grasp the higher-order concerns (argument, organization, use of evidence, following a thesis) then the lower-order mistakes will start to correct themselves. The truth is, over two-thirds of CityTech’s undergraduates did not learn English as their first language. Consider that many of them didn’t even learn it as their second language. 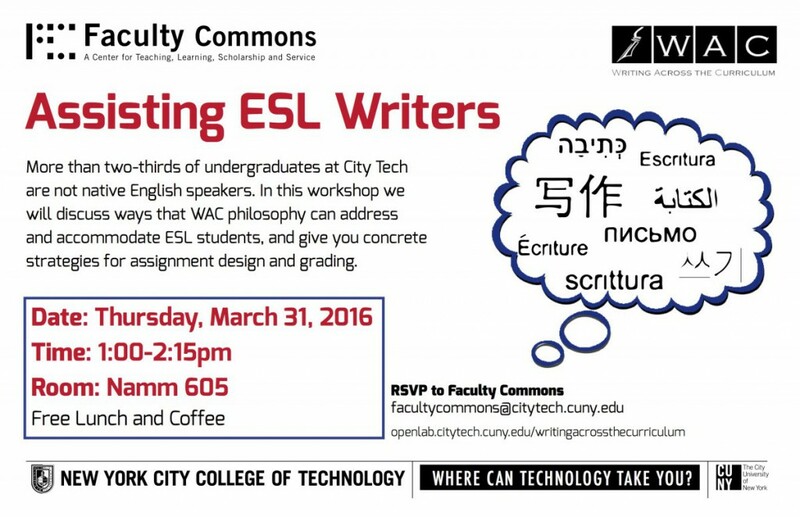 Our workshop this Thursday offers concrete tips and techniques for helping ESL students become better writers without leaving you feeling that you have to “teach English.” Come join us for lunch, coffee, and pedagogy!